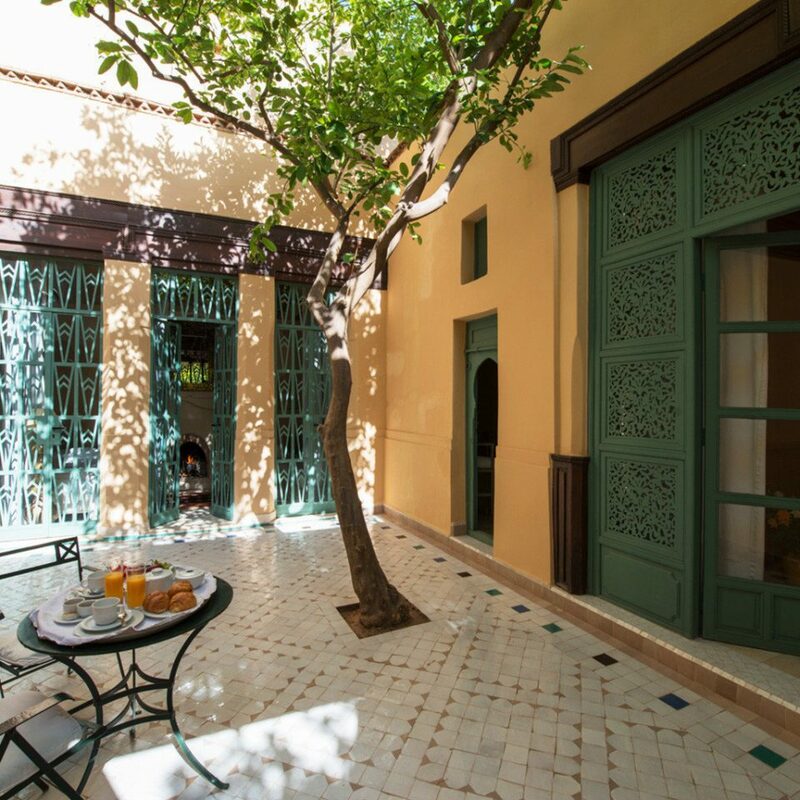 In the city’s leafy Palmeraie district, a four-mile drive from the bustle of the medina, Hotel Les Deux Tours oozes relaxed sophistication, combining traditional Moroccan architecture (arched doors, blue tiling and mosaic floors) with contemporary design. 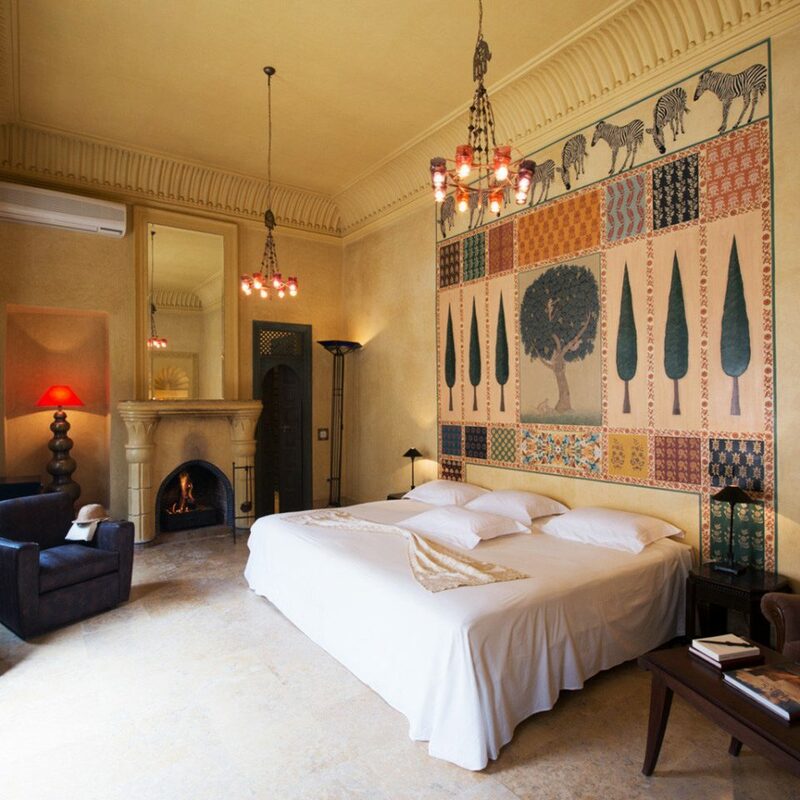 The 37 decadent guestrooms are individually designed and feature earth tone walls, pale blue window shutters, carved wooden headboards and traditional tiles. Splurge on a Residence Suite to have your own private pool and terrace. 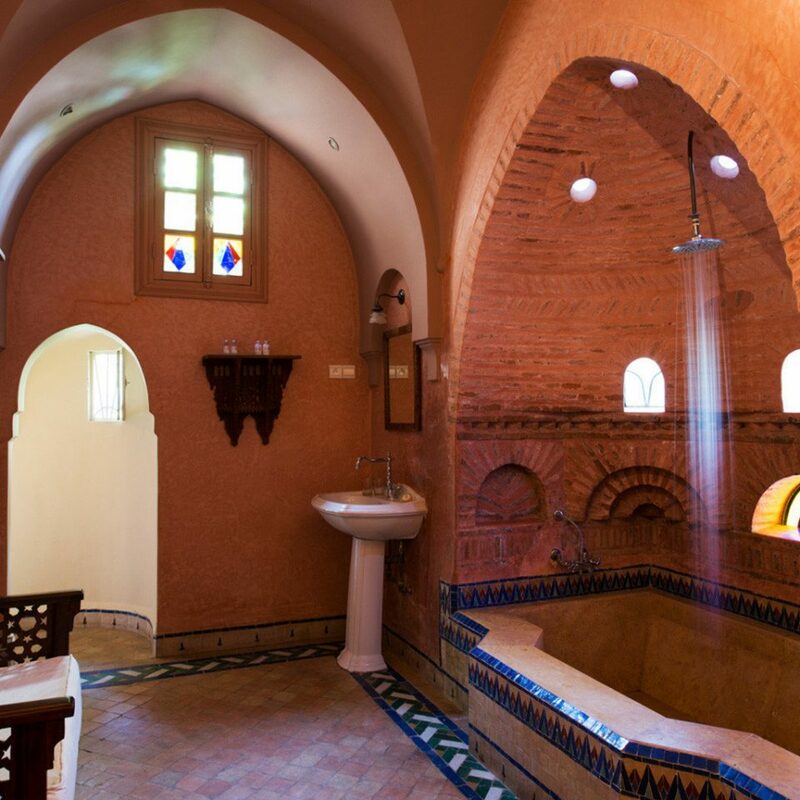 The bathrooms are sumptuous and soothing; there are sunken tubs in some of the suites, and all come with eco-friendly toiletries. 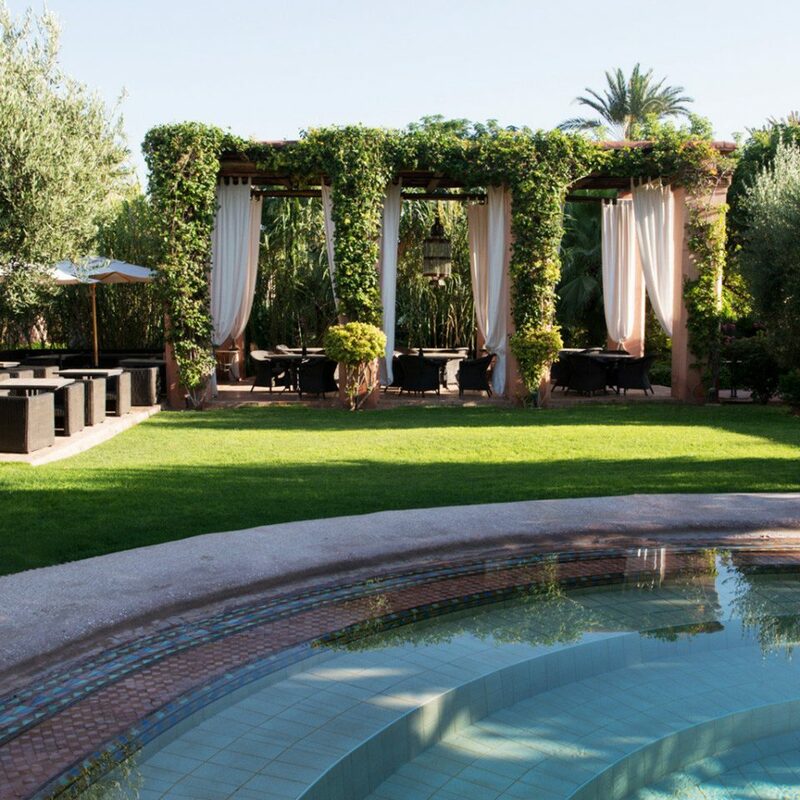 The grounds are spectacular: Huge four-poster daybeds are dotted around the pool and the Andalusian-style gardens, while the luxe spa offers Moroccan treatments and a traditional hammam. 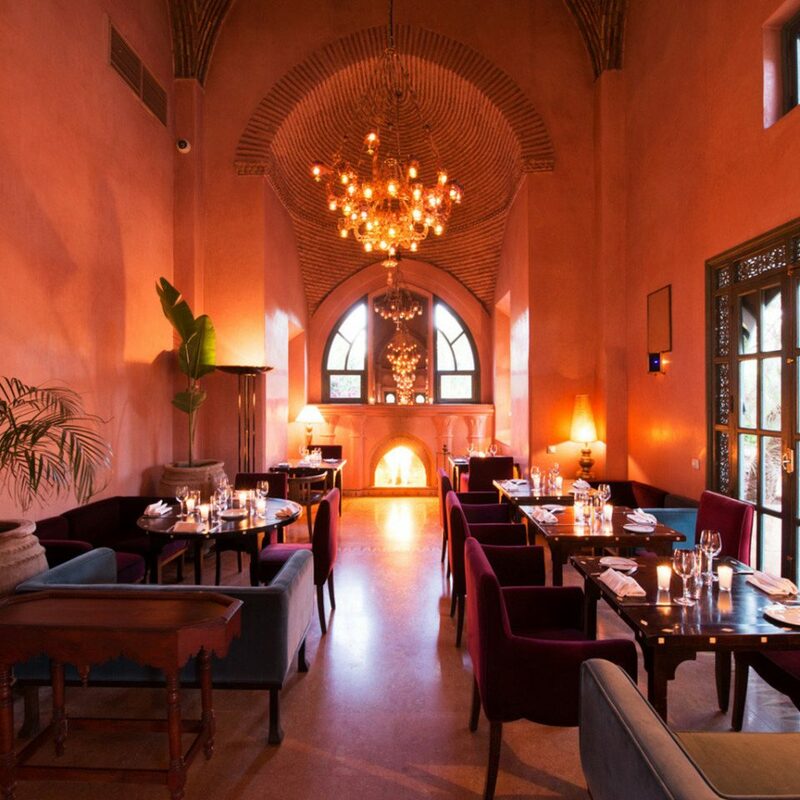 Tuck into French and Moroccan-inspired cuisine (spicy tagines, succulent sharing plates and vegetable briouates) at Le Salammbo, or dine on light bites and BBQ dishes at the poolside La Pergola. 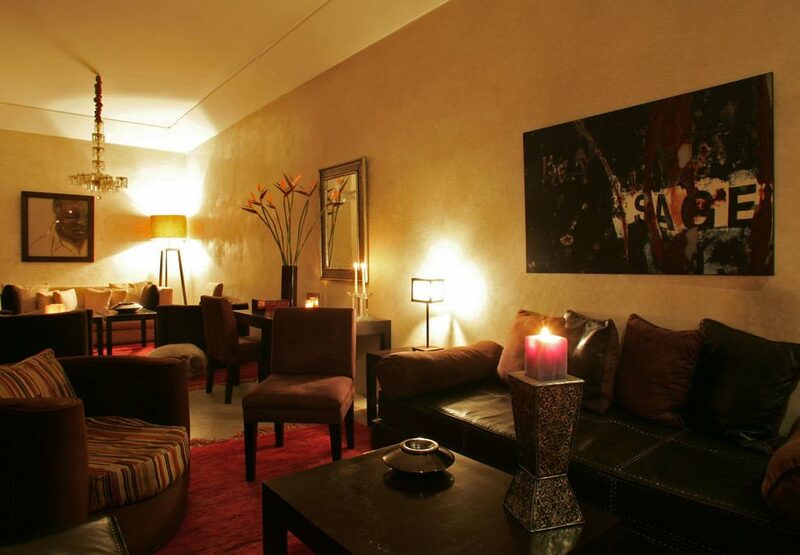 In the evening, recline on an oversize cushion at the lounge bar, which serves cocktails, wines and local teas. The dishes and cocktails are flavored with herbs and vegetables grown on-site. 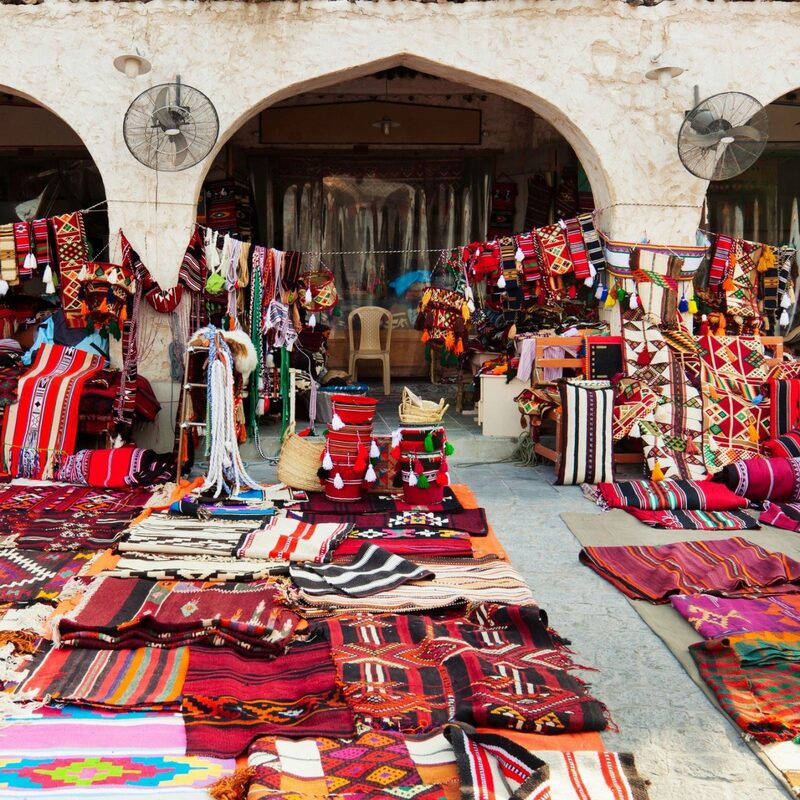 Take a day to visit the medina. Wander the souks, take in Jemaa el-Fna Square and make time for the 16th-century Ben Youssef Madrasa — which has Islamic designs that give Granada’s Alhambra a run for its money — and the vast, eerie ruins of the Badi Palace, on the outskirts of the medina. After wandering the labyrinth of streets, take a moment to catch your breath at the Jardin Majorelle, the stunning personal gardens of Yves Saint Laurent, which have been turned into a living museum. 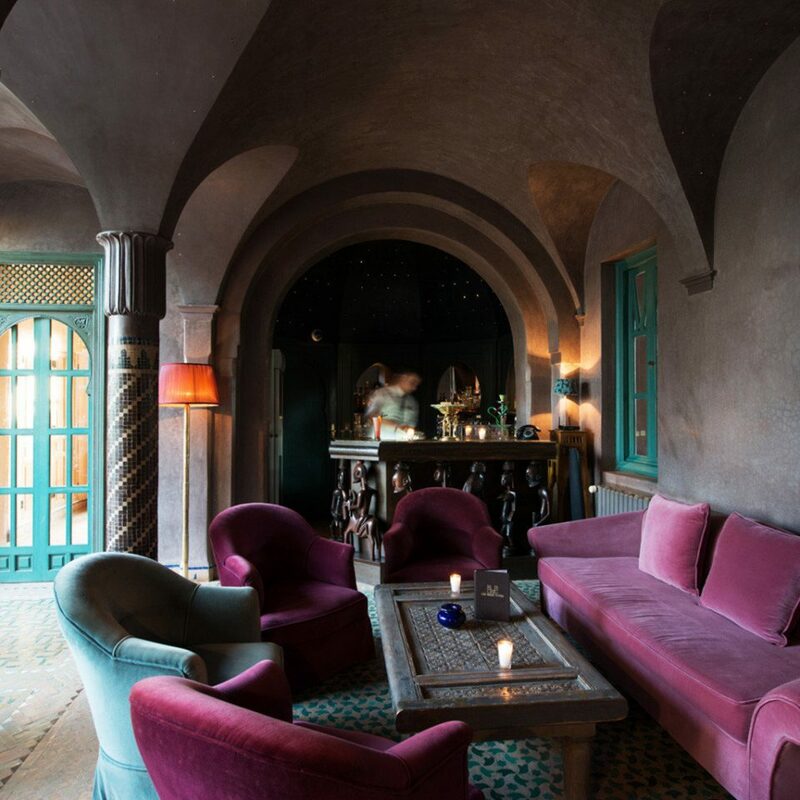 An evening at the Megarama Cinema, beside the Almazar, gives you a fascinating glimpse into modern Moroccan life. To immerse yourself entirely, see a film in Arabic — the comedies are so slapstick you don’t need to understand the words. 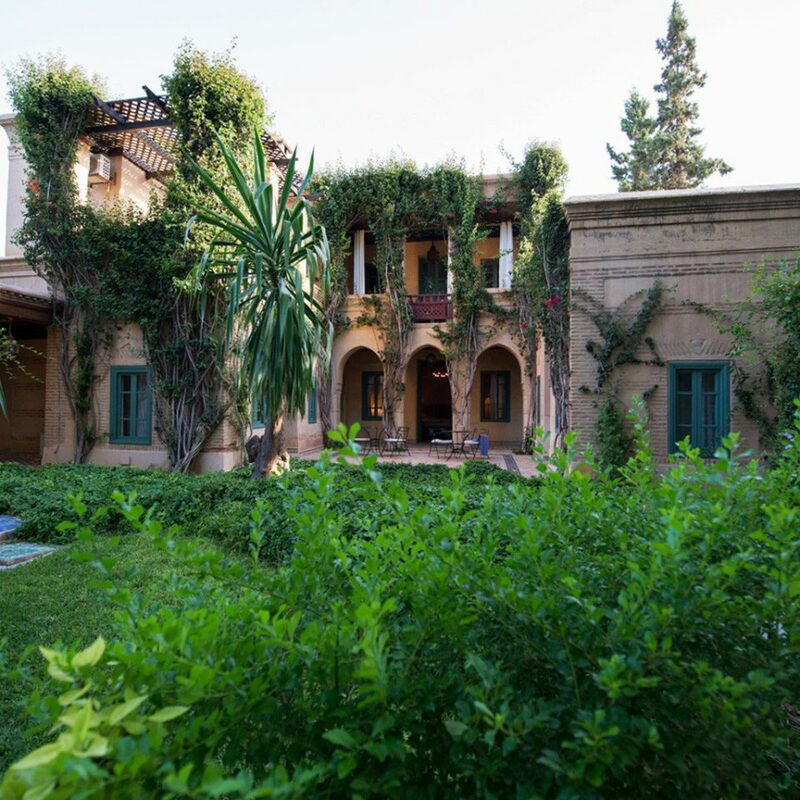 Run entirely by women and set in a traditional house complete with pretty gardens, Al Fassia Aguedal is one of the best traditional restaurants in Marrakech. 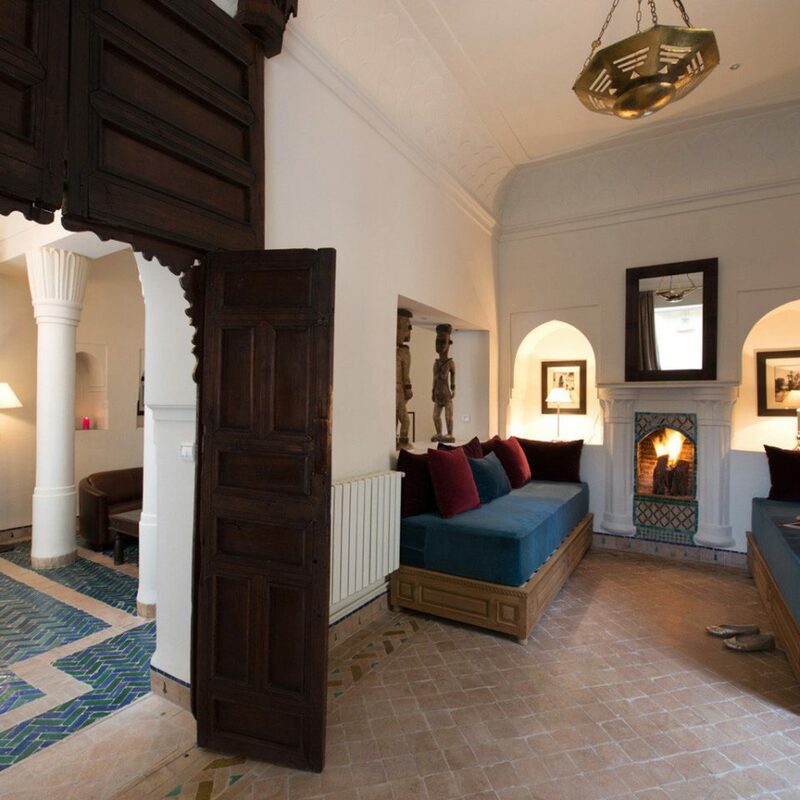 My husband and I stayed here last week as we were in Marrakesh for our friends wedding. I simply cannot explain how wonderful this place is. The grounds are absolutely stunningly beautiful. The service is excellent. The pool so beautiful. The restaurant terrace is incredible. Our room ( the most basic of the options) was better than 99% of hotel rooms I've ever stayed in. The management team, the wonderful staff, Kamil our driver.... thanks to you ALL for making our stay so memorable. We will see you next year ! Blissful experience 10 minutes away from the heart of old Marrackech. Went there for a romantic trip and couldn't be happier. Being away from the hustle and bustle of the city really made our whole experience of the country better. Great food (although the breakfast room could do with less flies), beautiful surroundings and very courteous staff. The rooms are beautiful and the heated pool meant we could go for a swim even in December. 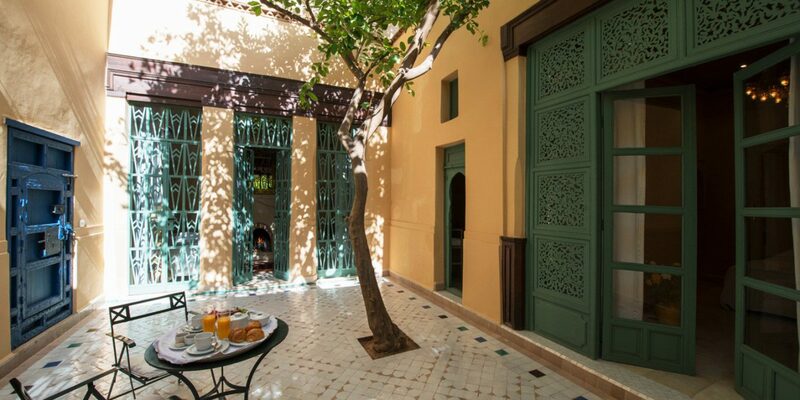 Having already stayed in the medina we chose to stay in The Palmerie and settled on this amazing hotel. 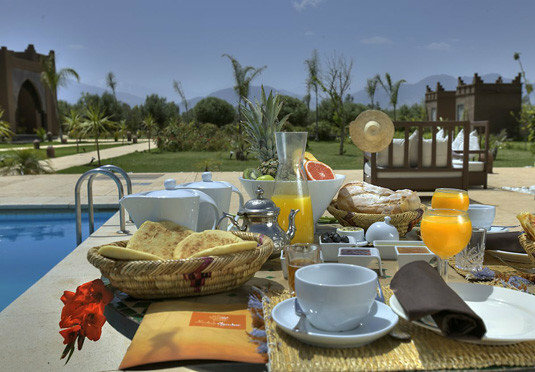 The hotel is set in beautiful grounds with a swimming pool and a garden where fruit and vegetables are grown and used in the restaurant. Peacocks, goats, terrapins and cats all co-exist happily in the grounds. Our room was breathtaking. 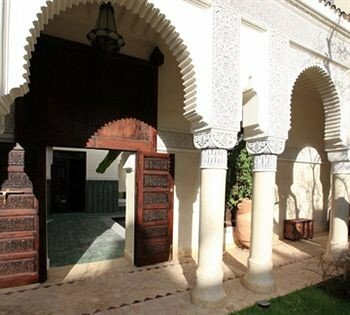 We stayed in a pool suite and it was our own mini riad. 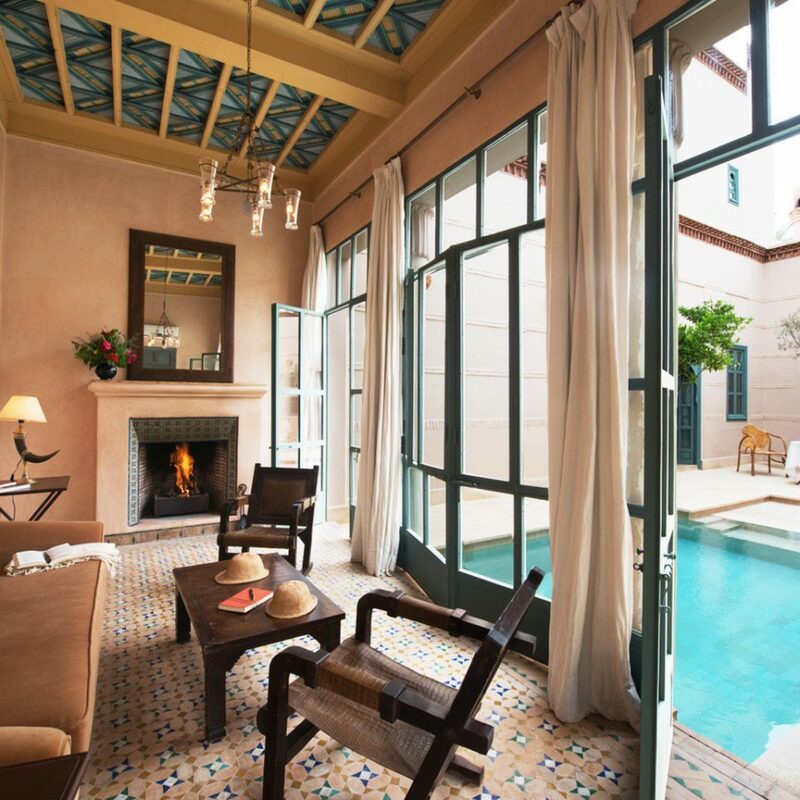 Double doors opened into a courtyard with our own pool. 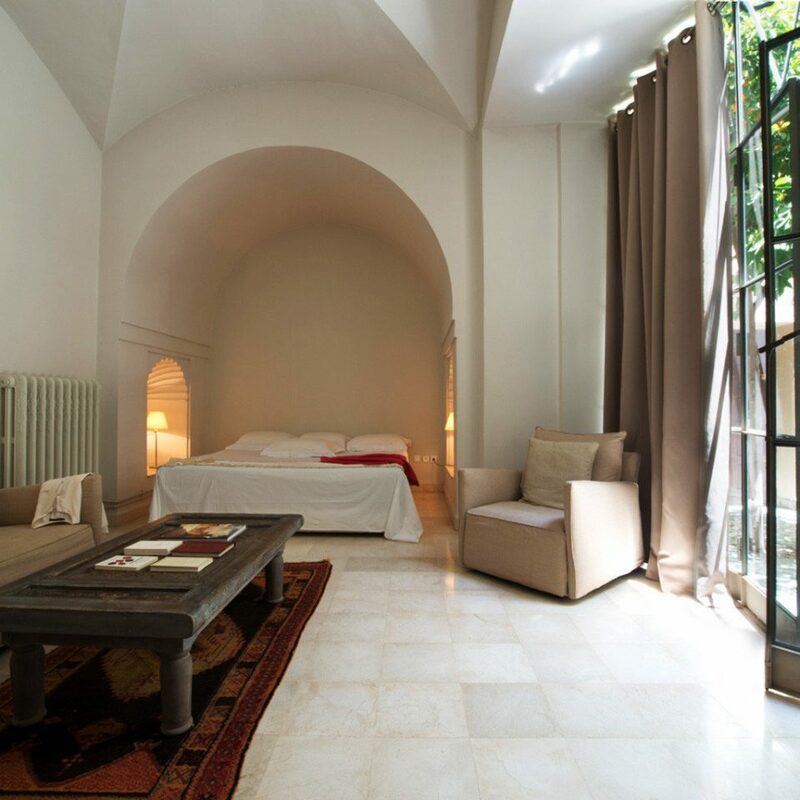 A huge bedroom, walk in wardrobe, toilet and large bathroom were on one side of the courtyard. 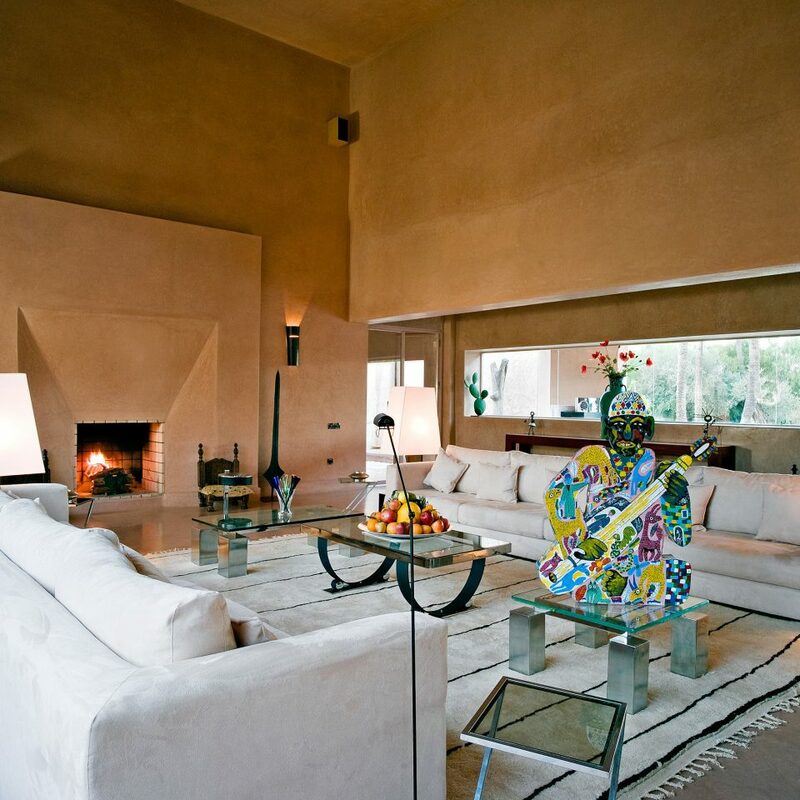 A living room which opened to a private garden was on another side. The bed was huge, the shower hot and powerful and the tranquility of our room want an excellent nights sleep. We ate in the restaurant every evening. It was simply superb. The staff in the hotel were attentive without being intrusive and were very welcoming. The gardens offered solitude in the sunshine. Absolutely loved this hotel and wouldn’t hesitate to return. This is a fabulous hotel with space and style. 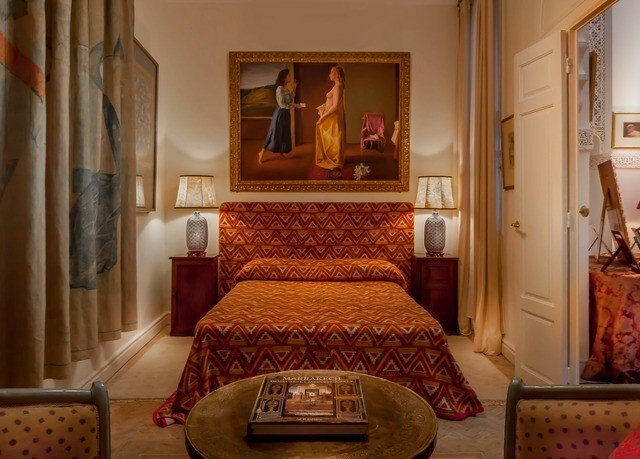 On our third visit, we booked a suite and found ourselves with our own stylish private home. 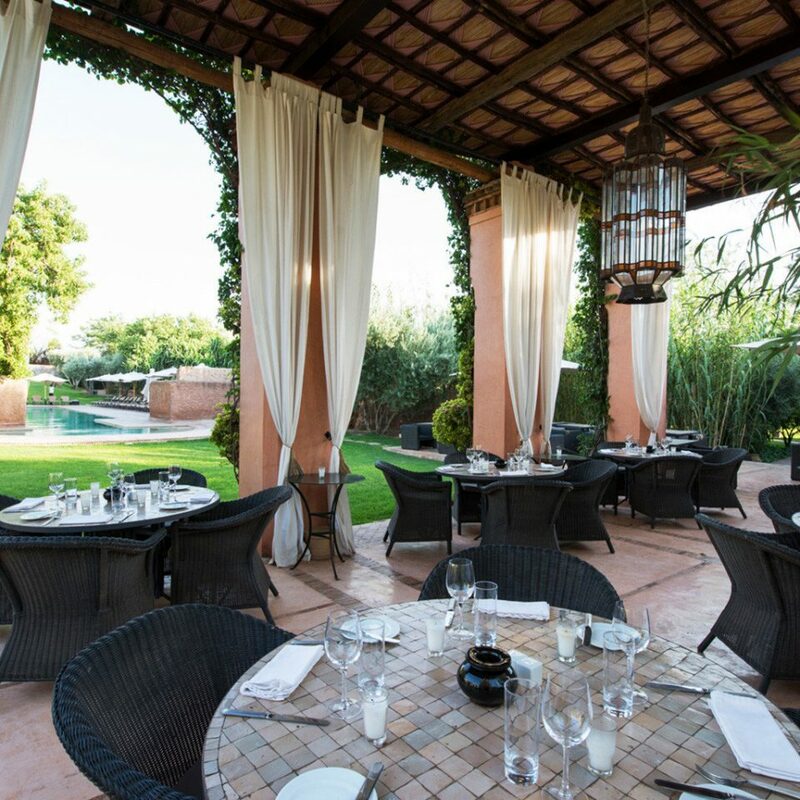 The superb pool area has been beautifully renovated and the restaurant continues to deliver a wide choice of local dishes as well as established classics. 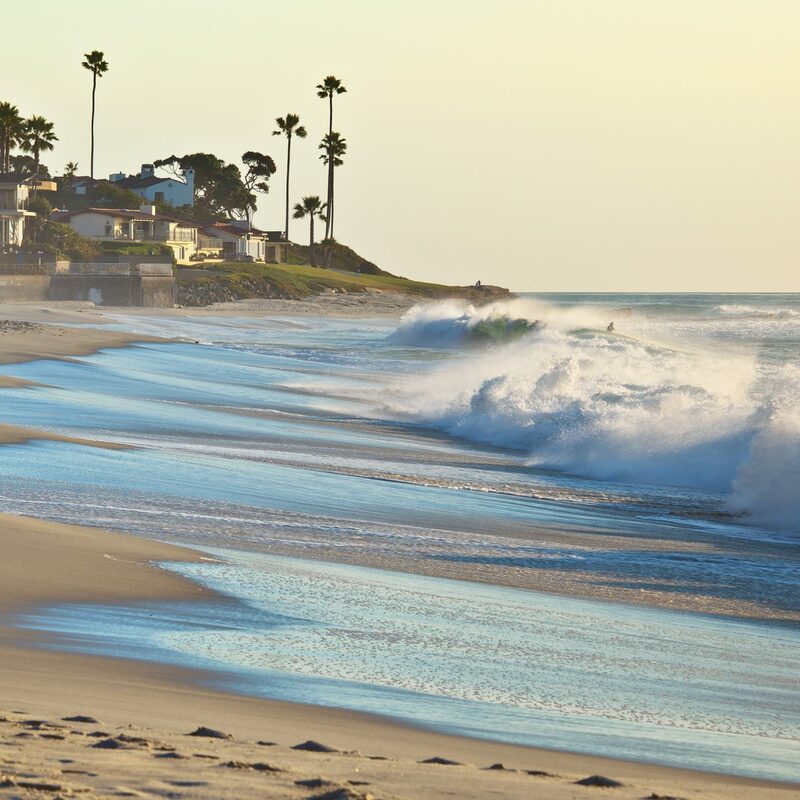 Everywhere there is evidence if thoughtful management aimed at giving guests space, service and a relaxing holiday. What a lovely place this was! 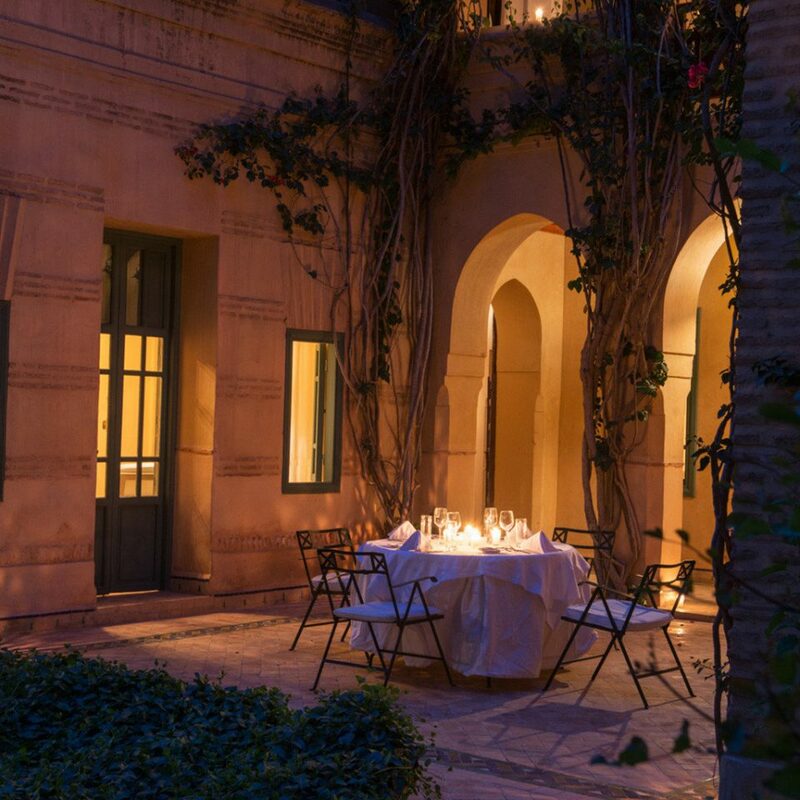 We ended our Marrakech holidays here and it was the perfect finish. Very sweet lady who keeps an eye on everything and everyone, perfect service, lovely apartment, great pool, lovely lunch and the treatment at the Hamam was very good. The evening restaurant was not totally our taste, a bit too stiff and expensive and pretentious for our taste. Big plates and small portions. But the rest was just above all our expectations! We would come back! Thank you!